Julian Assange has done much harm to American interests over the last decade, and on Thursday the WikiLeaks founder moved a large step closer to accountability in a U.S. court. British authorities arrested him on a U.S. warrant after Ecuador finally waived diplomatic immunity after protecting him for seven years at its embassy in London. 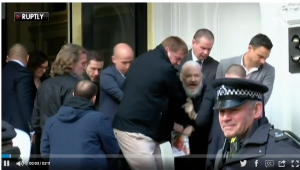 It’s notable, and welcome, that Mr. Assange isn’t being charged under the Espionage Act of 1917. Journalists including those at the Wall Street Journal sometimes feel the duty to disclose information in the public interest that governments would rather keep secret. Indicting Mr. Assange merely for releasing classified information could have set a precedent that prosecutors might have used in the future against journalists. If the charges are true, Mr. Assange wasn’t simply publishing documents that Ms. Manning sent his way. He is alleged to have actively collaborated to break into U.S. government computers—in a way that would make it harder to trace back to Ms. Manning. Mr. Assange’s lawyer says Mr. Assange was merely trying to protect the identity of his source, but helping a source illegally break into government databases isn’t legitimate journalism.